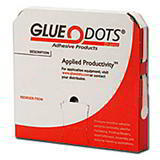 Glue dots will professionally present your product, enhance your brand, reduce costs, save time and provide a simple fix. All while staying out of sight. They can go anywhere and form an instant, invisible clean bond in a multitude of packaging applications in industry, retail, the home, crafts and in literally thousands of diverse applications. 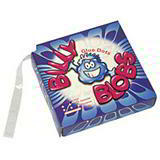 Supplied on a roll in convenient dispenser boxes in low, high and super high tack adhesives. The best adhesive solutions are the ones you can't see - secure it instantly and precisely with sticky adhesive glue dots. All our glue dots are kept permanently in stock so we can dispatch them within just two hours of receiving your order, when you place it before 3pm on a working day. And with most being delivered on the very next working day, you never have to run the risk of running out of these handy and practical adhesives. Whether you want something that can be quickly and easily removed once it’s done its job, or a super high tack option for a permanent bond, you can trust Davpack to deliver the goods – and all at a price you’ll find hard to match at any other UK supplier, not to mention our generous quantity discounts, which allow you to save up to 20% on your larger orders.